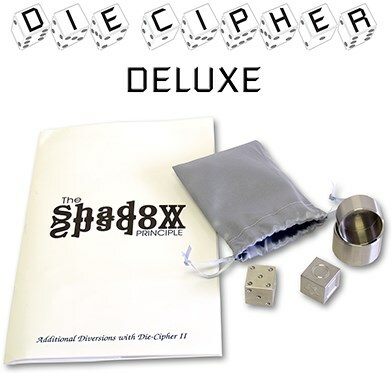 This deluxe set collects Die Cipher II, the ESP Die, both are constructed of stainless steel, and the Shadow Principle booklet in one convenient package. While your back is turned, a spectator examines a solid brass die, a round canister and its lid. He places the die inside the canister, any way he chooses, and remembers the number on top. He places the lid on the canister, sealing the die inside. You turn around, pick up the canister, concentrate for a moment, then announce the number that he is thinking of. You or the spectator can now open the canister, and the predicted number is revealed! A stainless steel canister, lid and die are examined by a spectator. The die has six different symbols, one on each side. While the performer looks away, a spectator places the die into the canister any way he wants, he then remembers the symbol on the top of the die and then covers the lid. The performer turns around, picks up the box and hands it to the spectator, asking him to hold it and concentrate on his symbol. Next, the performer picks up a piece of paper, concentrates, then draws a symbol. The lid is removed from the box and the performer's paper is turned around...The symbols match! The Shadow Principle booklet offers additional handling methods and presentations for Die-Cipher II. There is also an explanation of the Shadow Principle...discerning the number by simply looking at the brass canister! Also included are a number of special "eye cards." A mystical, blue eye printed on quality business card stock. This provides a consistent surface for shadow reading. Some of the cards have the numbers 1-6 printed on their backs for a nail-writer prediction.